Believe me when I say I DO have historical SCA pieces I’ve been working on. I’ve just been delving into the wonderful world of fantasy and steampunk a bit more these days. I should say I have too much garb, which is why I’m not working on any at this time. One can never have enough garb. My next project is a huge SCA garb project involving period research on Persian garb combined with a Game of Thrones inspiration. 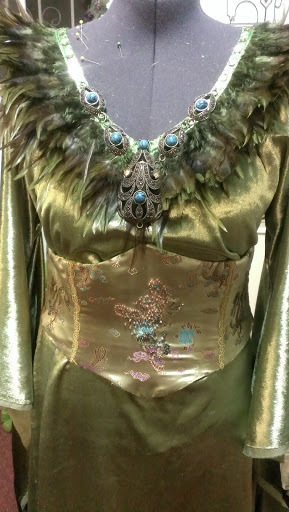 Its baronial wide challenge myself and other costumers are taking on for the upcoming 12th Night event. One of my all time favorite events is this coming weekend; Labyrinth of Jareth, aka Labyrinth Ball! If you’ve been a follower of this blog, then you know I’ve been attending LoJ for years and years. This year will be the first time I go both nights though and I am super stoked! 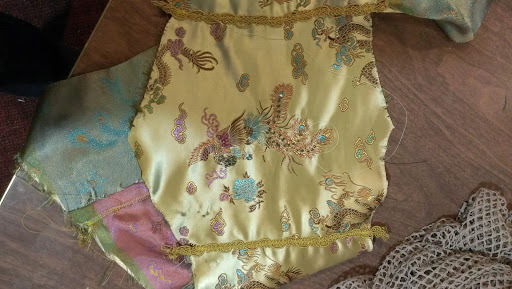 Friday night I plan to wear the fish lady costume I recently created for Gaslight Gathering with a little embellishment here and there (retooling the skirt mainly). Saturday night will be when I haul out the new costume, my Siren Maiden. I decided to fly blind this year and not really work with a fully realized design in my head. Its been an adventure. I have to admit though, creating on the fly is something I haven’t done in years so this has been a fun exercise in creativity. I tookone of my original characters as my inspiration again (using Adelle, a half siren) and jumping from there. Usually people think siren and instantly go the mermaid route. Instead I leaned towards the Greek version of a siren where they were more bird-like. At first, I considered going the Greek route with the garment shape since that was my jumping point. But the fact is, I really do not look good in a chiton. I resemble a badly squeezed tube of toothpaste while wearing one. 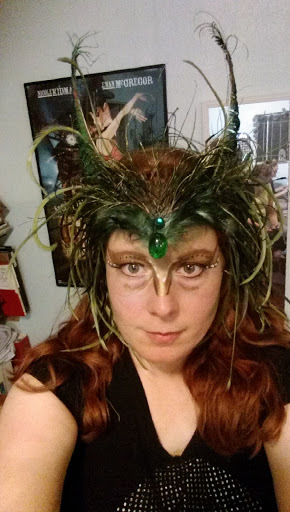 So instead I busted out the fantasy look. I wanted the dress to be simple with a touch of the pre-raphaelite to it so Iused the basic T-tunic pattern and embellished. 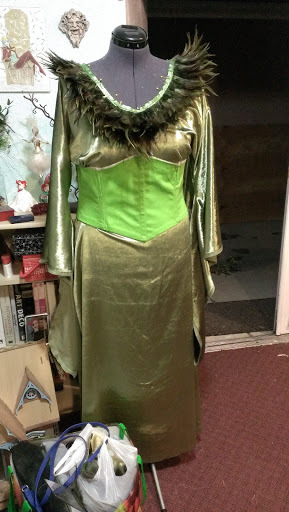 I added the angel sleeves and some gores to the skirt to make it fuller. The fabric is a crazy, shiny, velvet that I inherited from a friend. The sheen reminds me of feathers. The feather trim I picked up on one of my L.A. fabric district trips. I knew I wanted to make a bird like siren costume so I started to accumulate feathers. I really wasn’t sure what I was going to do with them until I cut the dress out. 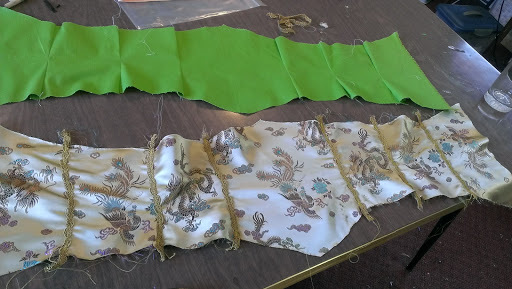 Originally the trim was going to lay flat on my shoulders but I really loved how exuberant it was when I flipped it. 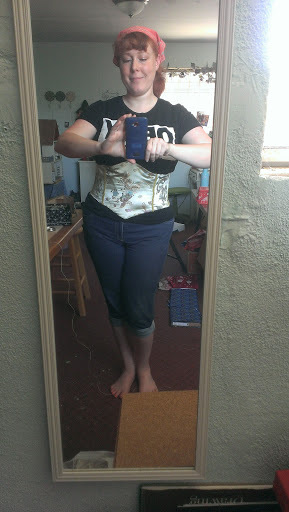 I added the waist cincher to show my figure off a bit more. The dress is pretty shapeless and needed a bit of structure to be flattering. 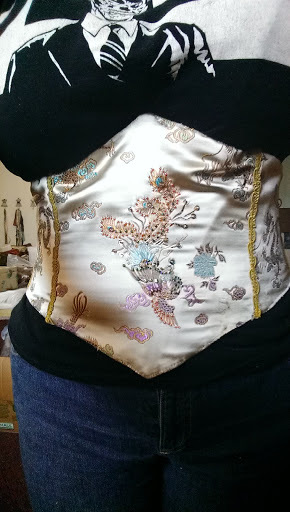 And honestly, I always wanted to make a waist cincher. This was a good excuse. The cincher was definitely the most constructed piece on the gown. 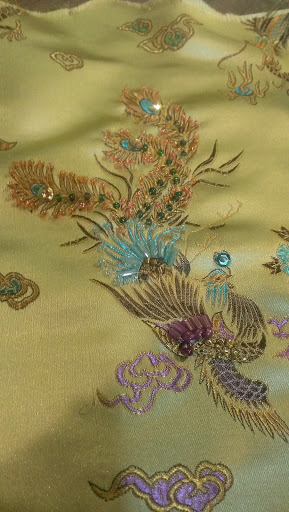 The brocade is of phoenixes and dragons. I fell in love with the print and snatched it right up. The pattern I used is from Truly Victorian. Its another easy peezy pattern of theirs. So far, I’ve been really impressed with Truly Victorian and their pattern work. Being the complete costume masochist that I am, I decided “Oh! I should bead the phoenix on the front! That would look epic!” Then realized how MUCH beading I had to do to get the look I wanted. About half way, my left hand wanted to reach up and strangle me for making it bead for so long. Half way point. Lots of hand cramps followed. Eventually I got the beading done and it looked better than I anticipated. By then though I gave up on the idea to keep beading the front panel until it was all encrusted. I really don’t have enough booze in my house to pursue that decent into madness. The cincher managed to get finished without me summoning the dark lord Cthulhul. It was the beading that drove me towards the brink. But after that? Smoooooth sailing! The only downfall to this costume is the fabric does not breathe so great. I’m hoping the evening isn’t a hot one. Oh the things I suffer for fashion. ← Gaslight Gathering 3 : Traveling the Seven Seas.